In the previous installment of this "Ark of the Covenant" series, we looked at the Ark's history in the Bible. Today, we'll look at the main theories as to where the Ark is today. Those who believe the Ark was lost when the Babylonians conquered Jerusalem and destroyed the Temple point to 2 Kings 24:13 and the parallel passage in 2 Chronicles 36:18. Both assert that "all the articles of the house of God, great and small, and the treasures of the house of the Lord" were taken to Babylon. 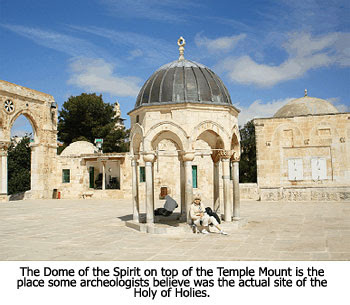 But the Jewish sages have always argued that King Solomon anticipated attacks on Jerusalem and the Temple and that he therefore constructed a vault for the Ark that was located deep within the Temple Mount and protected by mazes and false passageways.1 Further, they point out that when the Jews were released from Babylonian captivity by Cyrus, the Ark is not mentioned in the list of Temple treasures that were given to those who were returning to Jerusalem (Ezra 1:5-11). In 1981 some Jewish rabbis started clearing debris from an area next to the Wailing Wall area in order to set up a synagogue. In the process they discovered what is called Warren's Gate. It was a gate that had been discovered a century earlier by the British explorer Charles Warren during an underground probe, but had never been fully excavated. This was believed to be the gate that led to the area closest to the Holy of Holies. The gate was sealed, but the rabbis broke it open and started tunneling under the Temple Mount toward the area that would be beneath the Holy of Holies. But before they could get very far, they were discovered by the Muslim authorities and were forced to stop. "...the prophet, warned by an oracle, gave orders for the tabernacle and the ark to go with him when he set out for the mountain which Moses had climbed to survey God's heritage. On his arrival, Jeremiah found a cave-dwelling, into which he brought the tabernacle, the ark, and the altar of incense, afterwards blocking up the entrance"
There are some people who believe the Ark of the Covenant is in the Vatican. 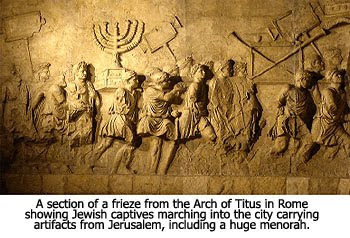 They base this belief on the fact that the arch that was built in Rome to honor Titus's victory over the Jews contains a frieze that shows Jewish captives carrying a large menorah, which is a seven-branched candelabrum. Regarding Menelik I, he ruled over Ethiopia around 950 BC, according to tradition. Manasseh did not become king of Judah until 253 years later. Therefore, Menelik's supposed removal of the Ark from Jerusalem could not have had anything to do with trying to protect it from King Manasseh. Another theory regarding the fate of the Ark is that it was translated or raptured, being taken up to Heaven to prevent it from falling into the hands of the Babylonians. This theory is based upon a reference to the Ark in Revelation 11:19. This passage is a flash-forward to the end of the Tribulation when Heaven opens and Jesus returns in wrath. 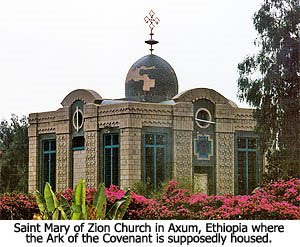 The writer states that when Heaven opened "the ark of His covenant appeared in His temple." In the final installment of this series on the Ark of the Covenant, we'll look at what future the Ark has, if any. PS - Hartdawg, I agree w/ El...not luck, but an answered prayer :) God is never early and never late, but always on time! Give Him ALL the glory! Well now this is interesting... I'm not quite sure where I think it is. But I do agree that it's no longer needed... hm, something to chew on, eh?